Lancaster held Colonial Beach scoreless in the second quarter and built a 27-point lead en route to a 61-14 home win in varsity girls basketball last Friday. The Lady Devils stand at 11-7 overall after splitting in Northern Neck District competition last week. Washington & Lee beat Lancaster, 59-37, last Tuesday. 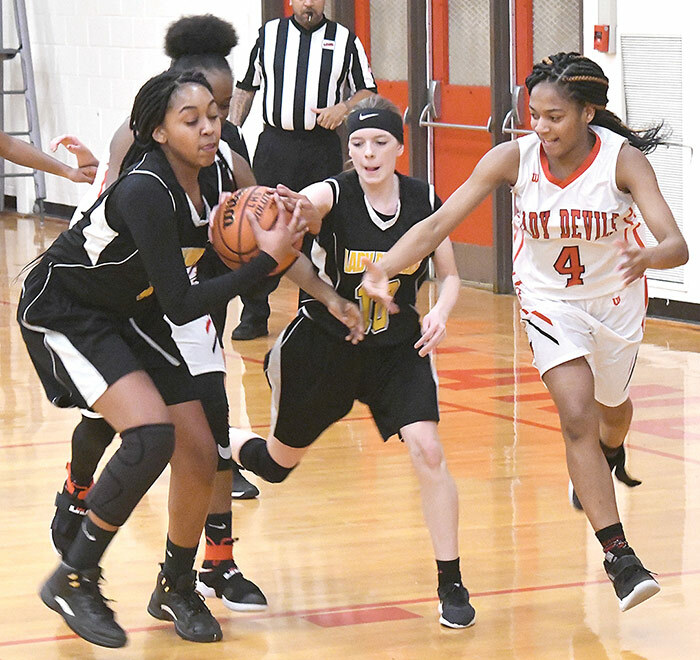 Laila Waters and Aniyah Brown each contributed four points and Abria Jackson and Raeghan Franklin each added a three-pointer in the first quarter as the Lady Devils tallied the equivalent of Colonial Beach’s scoring for the entire game. LHS opened with a 14-6 run then outscored the Lady Drifters, 19-0, in the second quarter and 16-2 in the third to take a 49-8 lead in the fourth. Khalia Harding had a game-high 18 points to lead eight LHS scorers. Carli Henderson finished with 14 and Jackson eight. The Lady Eagles held Lancaster to single digit scoring in the first three quarters last Tuesday and got double digit scores from four players. W&L outscored LHS, 13-6, in the first quarter and put up another 10 unanswered in the second to take a 30-13 lead at the half. Whitney Wolf scored nine points and Makaila Veney seven in the first half to lead W&L. Wolf, Veney and Devonna Fisher finished with 11 points each and Megan Smith scored 10. Jackson and Henderson finished with eight each to lead Lancaster. The Lady Devils will host Rappahannock today, January 31, and Mathews on Wednesday, February 6. The Northern Neck District tournament will begin February 11. In JV action, Lancaster improved to 13-1 last week after picking up wins over Washington & Lee and Colonial Beach. The Lady Devils beat the Lady Drifters, 28-23, last Friday behind an eight-point effort by A’Nijah Ball. Lancaster rode a 13-8 halftime lead to the final after trading shots with CB for an even 15-15 second half. Ball did the bulk of the work for LHS last Tuesday in a 34-23 win over Washington & Lee. Ball finished with 20 points for Lancaster, including eight of her team’s 12 in the third quarter when the Lady Devils outscored the Lady Eagles by six to open up a one point halftime lead.